Was very interested in this phone via all of the online info/pic's etc... This is a case where it (IMO) is a much better idea/product on the WEB. In person I am now left with a "MEH.... - " opinion. Price is not an issue as I was willing to pay to acquire but after playing with one for an hour or so this evening Edge is off of my list as next phones. I have a Note 3 and 4 and I can say that if I did not own either then I would consider the Edge, but as it sits I have a feeling the Edge pice (Gimmick - may be too harsh of a word) is not going to be as cool as I originally thought. Once you put a case on it, it will look like a slightly smaller Note 4 - not sure what the bonus of that is going to be. Keep in mind that the Note Edge screen can extend edge to edge, meaning the side bar is not always present. The Note 4 screen is 1/4" taller, but the Note Edge screen is 1/4" wider. Yep - got the width part but again after using one for a bit in store it was not the cool/want to buy factor that I was expecting it to be. Btw, the shop I was at had them in stock and the guy thought he would be able to sell (NOW). My att corp store had a display, but no stock to sell. Personally I liked it more than thought. In my right hand the side screen was not effected as much as I thought would be. There was some quick functions I liked the build looked solid to me. Would I choose it over my Note 4. Hard to say. Probably would since I'm such a tech junkie. But it's such a niche limited commodity, I'd be worried about updates. This sounds to be an extreme limited addition. AT&T will be releasing the Edge on Nov 18th. I was able to check one out in store yesterday and I must admit it is a VERY nice AND cool looking device. It goes for $100 more than the Note 4. Not sure if it's worth that much more but it definitely has me thinking about it. It's pretty slick. I do think that everyone will need to put it in their hands as some may not like the whole screen on the side thing, especially left handers supposedly. I found that less of an issue than I thought it would be. I have no idea how much of an advantage it will be having the edge screen but it gets 10's for cool factor. SO much better than the blah blah iPhone 6. As for a case: NO case for me. Far to pretty for that. Where did you come up with the 18th? Everyone has been saying this Friday. 14th. Can someone confirm this? BUT...how much sense does that make? The preorders are all going to be delivered starting the 17th. I know personally that if it's available in a store on Friday, I'll use one of my other lines upgrade eligibility and buy it. Then send the preorder back and straighten out the upgrade that is used at that point. And I'm sure others will do the same. Would be quite the nightmare for AT&T. But then again, they are a fairly brain dead group when it comes to the logistics of device releases. I was at first as well. Then I started watching some of the decent reviews like flossy carter on you tube and I think it's mobile tech something(it's a lady that does it) and then went back to the store a couple times and now I am thinking maybe I will get one. That was exactly me. 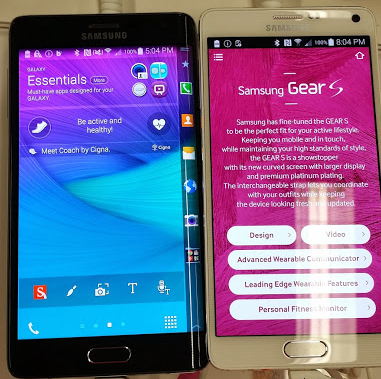 I had a Note 3 (and the 1&2) and the Note 4 just didn't seem to be much different. I was set on the Edge as soon as I saw it alongside the 4 for that reason. I was wrong on one point. The Note 4 might not appear much different, but was probably worth the upgrade just based on the screen, improvements and the performance that I see in my Edge over the Note 3. But the Edge gives you those and is also very different at the same time. hi new to android yay me. any way sorry if this has been asked nothing came up for force close. so say i am writing a text and i send to person then lock my phone, about 50% of the time the messenger app will tell me that it has an error and asks me to wait or force close?? some times i get a force close on com.android sompthing for the phone itself, then it will turn off network connections then re start them? some times when i get finished sending text with the app open and lock the phone, when i unlock it and click the box to start typing it will show the auto correction but will not type in the box. i would hafto close out the app and open it back up for it to work properly. i dont know of these are connected in any way or if some thing is wrong with the phone, and also the battery lasts 8 hours max with sending about 150 ish messages and probably 20 mins on browser. thanks for any help or suggestions i am sleepy 30 hours awake. The note 4 is absolutely a worthy upgrade. A lot of people won't to classify Samsung as a baby Apple that only do incremental upgrades to get by. That's not true in the slightest. People have to realize that no company can simply do a complete design rehaul each and every year. Its the hardware that's an important factor(same as it is with car makers). You will never see a car maker change the body style completely every year. Its a gradual process. I'm very proud of my Samsung products. Sure I have somethings I would like done different, but the pros always outweigh the cons for me. I have both the Note 4 and Edge. I haven't figured out which one I like better because I'm still learning the Edge. It's not a bad service at all, I just want to see how much use I get out of the side panels. Mu hubby has the 4 and I have the Edge. They're both great phones actually but I love the uniqueness of the Edge and will play with it (and use it) more than my hubby would. You just can't go wrong either way. I agree, I'm trying to learn the little things about the device that will allow me to get more out of the Edge screen. I will say one thing. It was kind of freaky at first when I'm doing something on the phone and get a call in. I'm not used to looking on the panel to see who it is. That took a little getting used to but I like it because I certainly hate it when I'm in the middle of something and someone's face pops up in mine. One little small change I've made is to remove my clock radio altogether. I now use the Note Edge exclusively as my night stand clock and alarm. One amazing feature I found under the alarm clock settings is called Smart Alarm. Smart Alarm wakes the device about 3 mins before the scheduled alarm time, but with a slow gradual tune and dim light. It's a kind of hidden feature, but I tried it out this week and now it's one of my favorites. Joke Adema and alhadee12 like this. Thanks, I'll try it out and see how it works for me. I use an app alarm that opens to a Pandora station I created for morning music. It also has the gradual loudness increase also. Can the Smart Alarm open an app or do something like this? Can it open a music app? I like waking to Pandora because I get a variety of music each morning rather than the same songs. I found waking to the same song(s) I like conditions me to hate those songs. Smart Alarm has a few select tunes to choose from. Unfortunately, it doesn't allow the opening of a music app. Why has my Galaxy S3 begun bootloops with a black screen? Why does my daughter keep getting texts in Chinese using Go SMS Pro? Google Nexus 6 Any disappointments in the software for you?